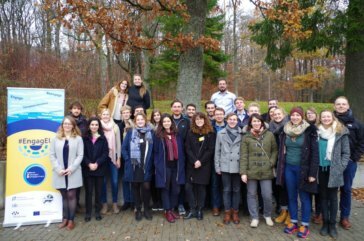 On 29 and 30 November 2018 the Institut für Europäische Politik (IEP) and the participants of the #2ndYoungCitizens’FutureLab were hosted at the Europäische Akademie Oztenhausen (EAO) in the frame of the project #EngagEU, co-funded by the Europe for Citizens Programme of the European Union. The topic of the discussion was “Security, Migration and the Future of Europe: Turning Moods into Opportunities” which was intensively debated by 30 young citizens from six European countries. They developed ideas and visions for the future of the EU and its asylum and migration policy. The results were also presented and further discussed at a public Vision Night in Saarbrücken with around 100 citizens. #EngagEU invites young EU citizens to take part in a broad consultation and idea development process till March 2019 aiming to strengthen the voice of young citizens in the European elections campaigns 2019 and to set the next European Parliament’s agenda with their visions and ideas. To which extent are homogenous societies more peaceful than heterogeneous – Does the increased heterogeneity of one society lead to less internal security? How could equality, fairness and solidarity among the EU member states be improved and how could the differences and tensions among the member states be reduced? How are and should migrants be represented on the national and European Level? This first consultation and idea development process was continued at a public Vision Night. The participants were represented by elected rapporteurs who debated the results of the first day and of the #1stYoungCitizens’FutureLab of 27 and 28 September 2018 with an interested audience and with the political scientist and author Claus Leggewie. In his new book “Europa Zuerst” (“Europe First”), Leggewie formulates a declaration of independence for Europe. Following a review of the current political situation in the EU the four rapporteurs and Leggewie discussed the ideas which were developed during the two #YoungCitizens’FutureLabs, e.g. a school subject “Europe” or a European project week, establishment of e-participation tools (following the example of Estonia), a fact checking platform on a European level and couchsurfing opportunities for young citizens who will benefit from the #FreeInterrail initiative. The improvement of EU-Communication through the use of easy language in order to reach out to a wider public. Free language courses for all European citizens to improve the communication between citizens and to facilitate the feeling of a European community. Further development of the Erasmus-Programs. It should reach more people outside the academic world and improve European mobility. The marketing of possibilities for monetary support, the Interrail initiative and the European Voluntary Service should be improved. Development of a “European Citizens Council” supported by a new platform with a tool enabling the citizens to address their concrete ideas and innovative proposals to decision-makers. The establishment of a “European Peacekeeping Task-Force” which builds upon voluntary commitment. As a starting point this Task-Force could be transformed in a European army. Regarding some of the proposals like the introduction of a European week or improved conditions for Interrail there is a broad consensus among the participants of the first two #YoungCitizens’FutureLabs. There was also the tendency that young citizens would like to see a strengthened European identity, a stronger voice of young citizens in actual policy making as well as the removal of language barriers and the development of the EU institutions. The formulated proposals which were collected so far are further discussed on the platform OPIN which is a web-based e-participation tool that aims at higher youth participation. Participants are currently able to elaborate, discuss and vote on their ideas. After completing the #3rdYoungCitizens’FutureLab in Nice (January 2019) and the #4thYoungCitizens’FutureLab in Warsaw (February 2019) the participants will decide which of the proposals and demands they think are most important. Those will be summarized by the rapporteurs in a Manifesto which is going to be addressed to and discussed with the public and policy-makers in #YoungCitizens’Conventions in May and September 2019.